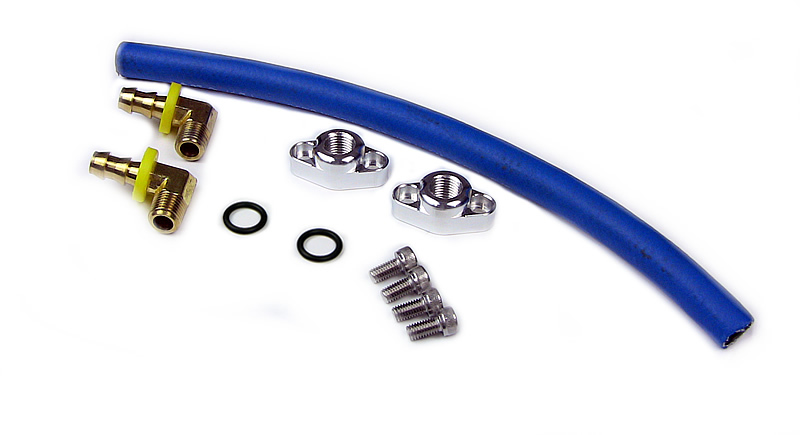 This Spencer Cycle oil cooler bypass kit allows you to remove your oil cooler for weight savings or when your exhaust system won't allow you to run an oil cooler. Our oil cooler bypass plates can use the factory O-rings however each kit is supplied with new orings and stainless steel bolts. No other kit on the market is as complete as this one is. We designed the Spencer Cycle Oil Bypass Kit with functionality and form and great looks in mind. The kit keeps the nearly the same inside diameter of your factory oil lines size. Competitors kits on the market have 1/8 NPT threaded holes. This is smaller than the factor lines that came on your motorcycle! Our oil cooler bypass plates incorporate 1/4 NPT fittings that more closely match the factory oil line inside diameter as to not restrict oil flow. Quick installation is provided by the use of push lock hose and fittings. All you do is push the hose over the ends and that is it. The special barb fittings are made to allow the hose to push on and not pull off. No drilling,tapping or plugging needed. A simple bolt on process. Usually hose clamps are not needed. The hose supplied is manufactured by Goodyear and is a special purpose hose designed to work only with the push lock fittings include din this kit. This is not a fuel line and it is for high heat and pressure applications. Click the button below to add the Oil Cooler Bypass Kit -Suzuki GSXR1000 (2001-2008) to your bike build.